So I haven't been having so much of a tarot-focused week...too many other things competing for my attention/thoughts, I suppose. Here's another pretty relevant quick draw I did this morning, though. 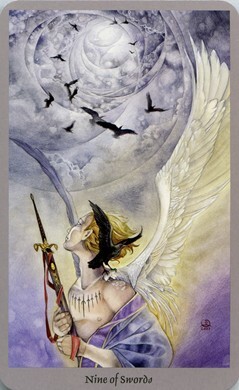 I really like this take on the nine of swords especially. A card that usually speaks to worries, anxieties, fears - the crippling fear that keeps you awake in the middle of the night, mad swirling thoughts. Here we see a sky full of dark clouds, stormy, but above it all we see quite literally, a light at the end of the tunnel. Things swirling up towards hope. And those dark black birds, the pecking, cawing thoughts, are slowly flying away from the girl. Or are they flying towards her? Could be read both ways, I suppose, but here I see them as flying away - as the need to let worries go sometimes, let them fly off somewhere else and focus on the good. The influence of the wand queen, see. The shadowscapes is really one of my favorite decks when it comes to the courts. So detailed and expressive, so perfectly capturing the nuances of what the kings and queens and knights and pages each represent. 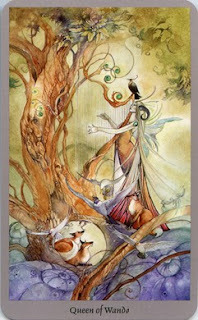 The queen of wands is perfectly at home in her domain, creatively fulfilled, working on what she is good at and what she enjoys, supported by the animals and even the plants. There is light there, an aura of comfort, completeness, self-possession. She is a woman who has already grown much, traveled far, and she continues now to work on advancing further. These two cards are good reassurance for me right now. I recently voiced my frustration with the uneven pace/student effort in my arabic classes and my wonderfully accommodating language school re-arranged things so that starting next week, my classes will be significantly more challenging. A part of my is feeling that 'oh crap, what did I just do/get myself into' nervousness, but these cards remind me that this is a good thing. Being challenged means learning, getting more out of my experiences, growing and becoming more confident, like this queen is as she plays her instrument. Time to let the dark birdies fly away indeed.